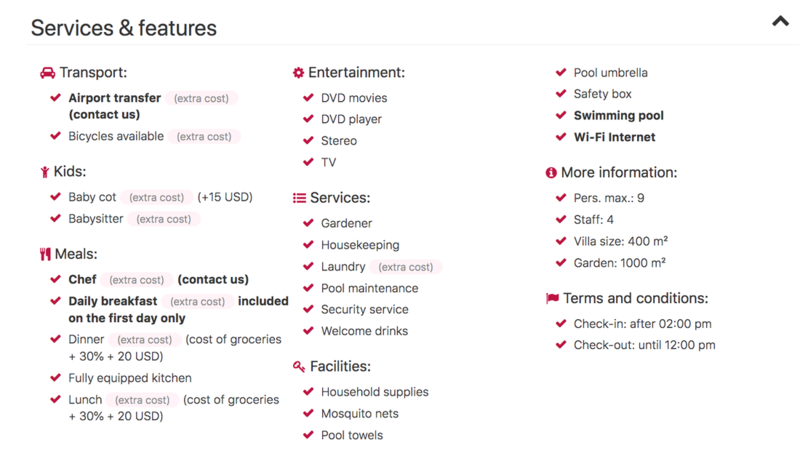 Booking Rental below are 1 Night Stay Charges for upto 8 adults, they exclude service charges & applicable taxes besides a Damage Security Deposit. 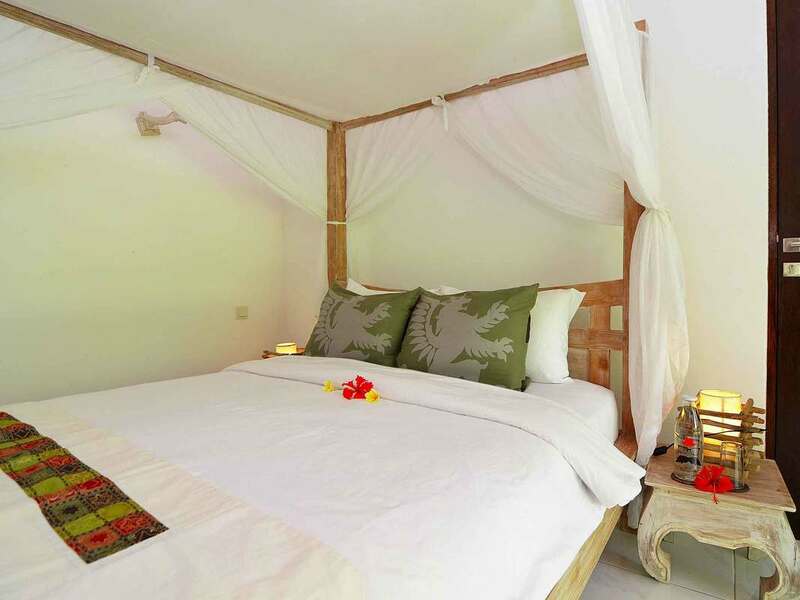 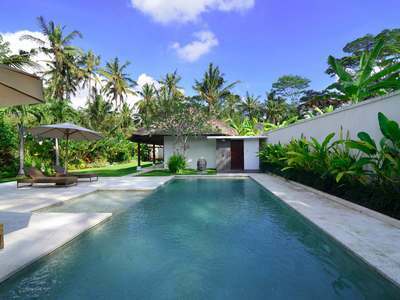 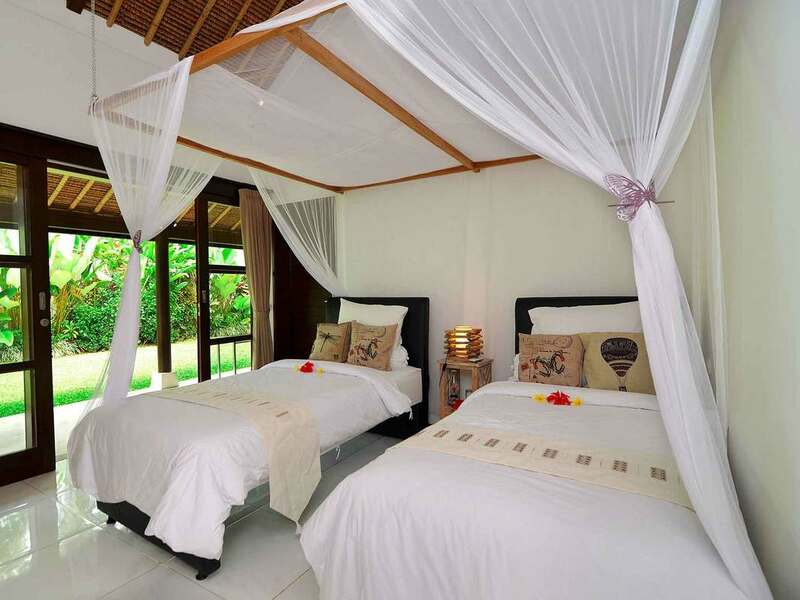 Situated in one of Ubud's many traditional villages, Villa Candi Kecil Empat is the larger one of the two Candi Kecil private pool holiday retreats, which can be rented out separately of together as one big holiday haven to accommodate large families or groups of friends. 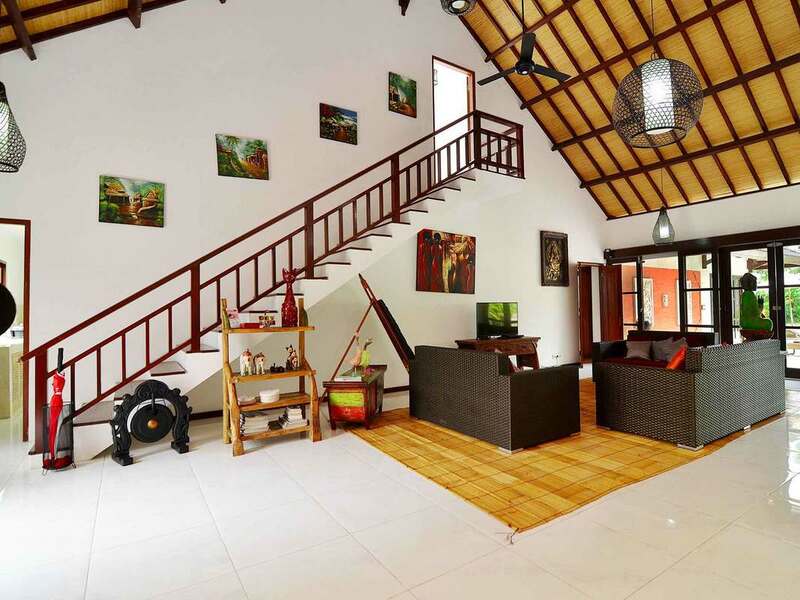 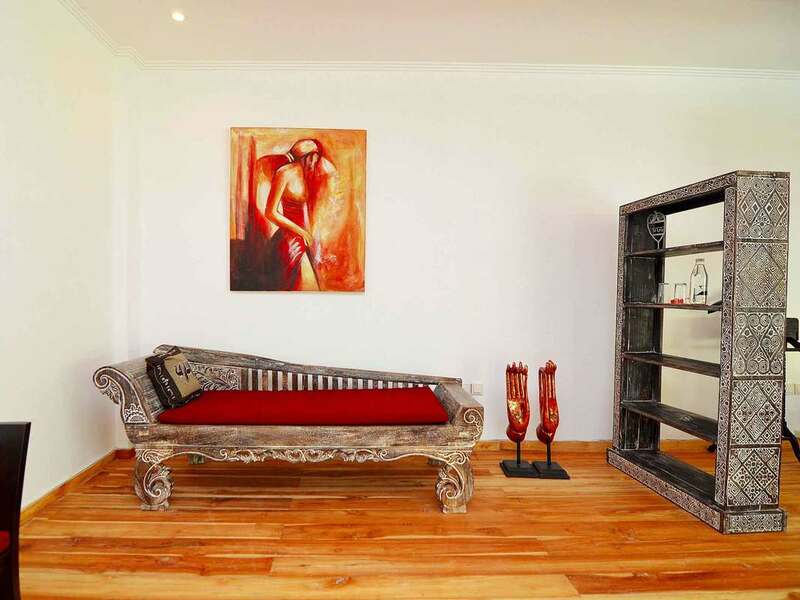 Villa Candi Kecil Empat enjoys the best of both worlds; located just off of the main tourist grid of Ubud, but is still only an 8-minute drive to the iconic Goa Gajah Temple and just 15minutes to the town center. 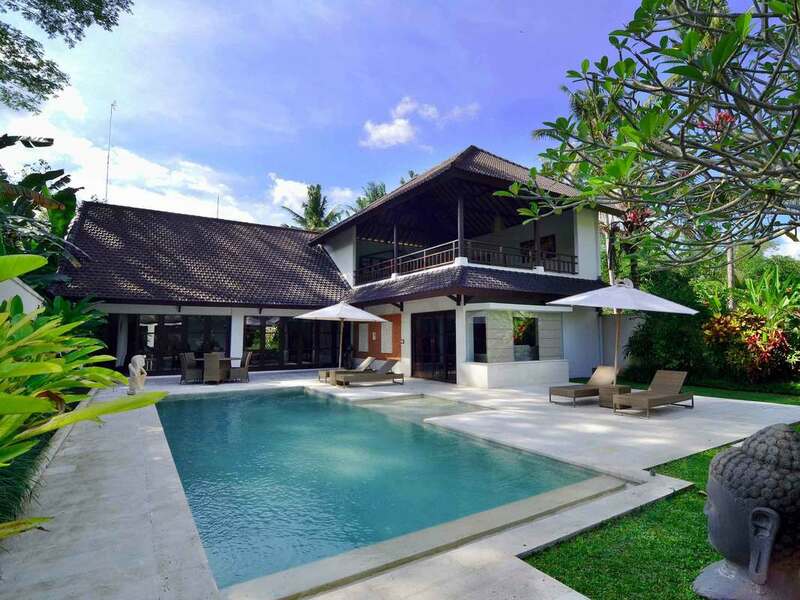 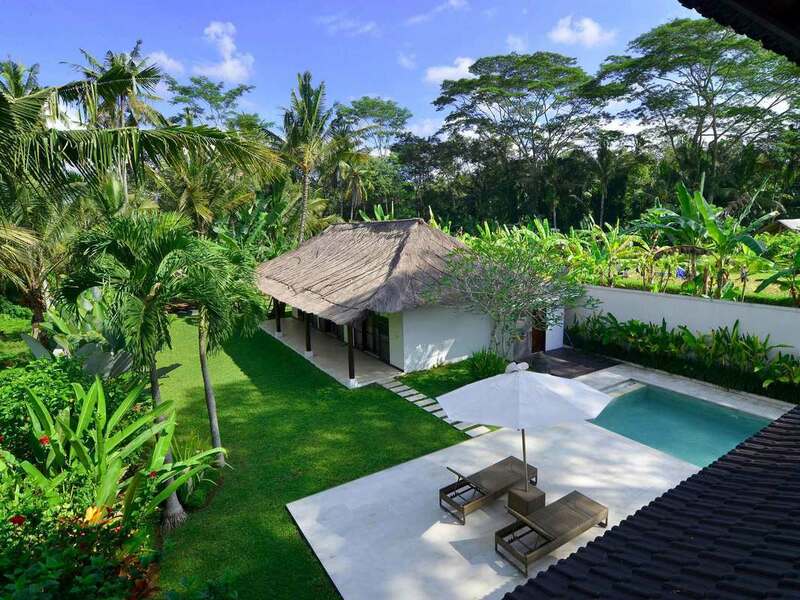 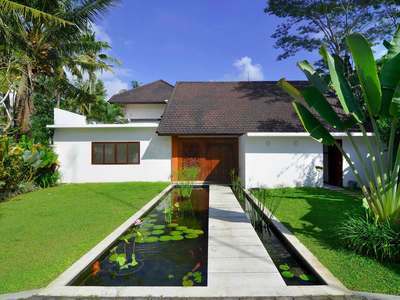 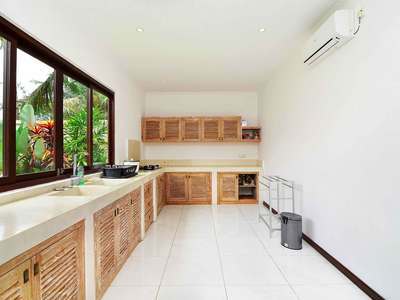 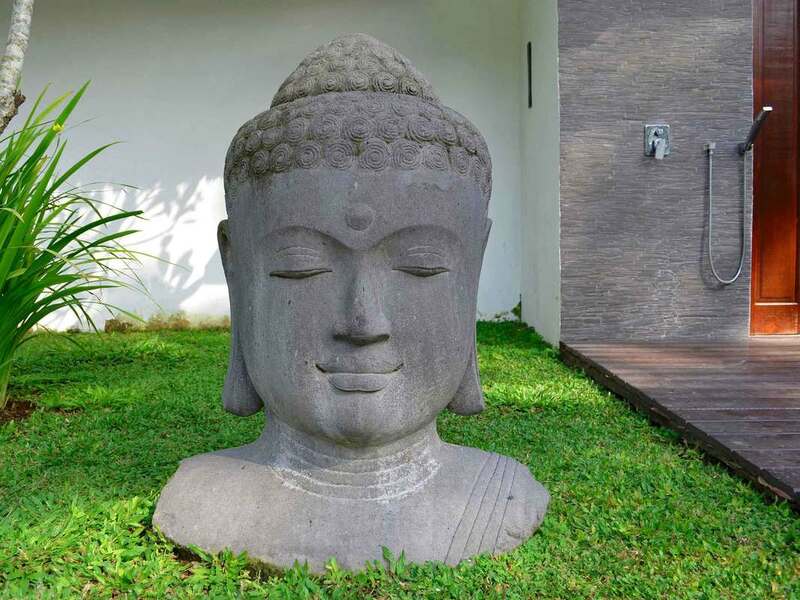 Boasting a huge sprawling garden with a grassy lawn and glistening pool, and a spacious living and dining area, this villa is a great value for the price in the heart of Bali's cultural hub. The outdoor area of Villa Candi Kecil Empat is very spacious, sunny and tropical. 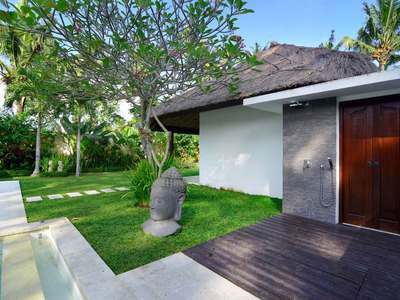 Encompassed by a stone patio sparkles a 12-meter private swimming pool with a shallow inlet for getting in and out of the water (also makes a great spot for kids to safely splash around under supervision of parents). 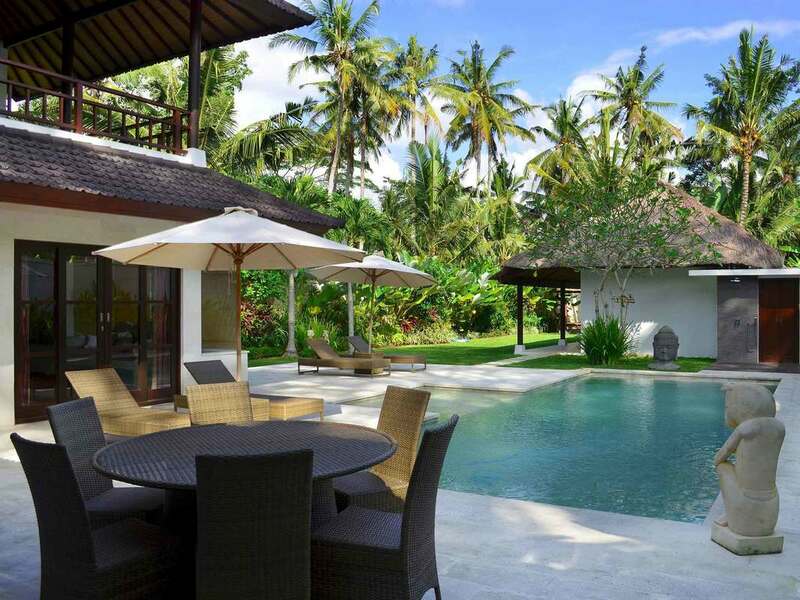 Next to the pool, there are comfy reclining sun chairs with umbrellas, along with a circular outdoor dining table so you can enjoy all of your meals alfresco style if you wish. 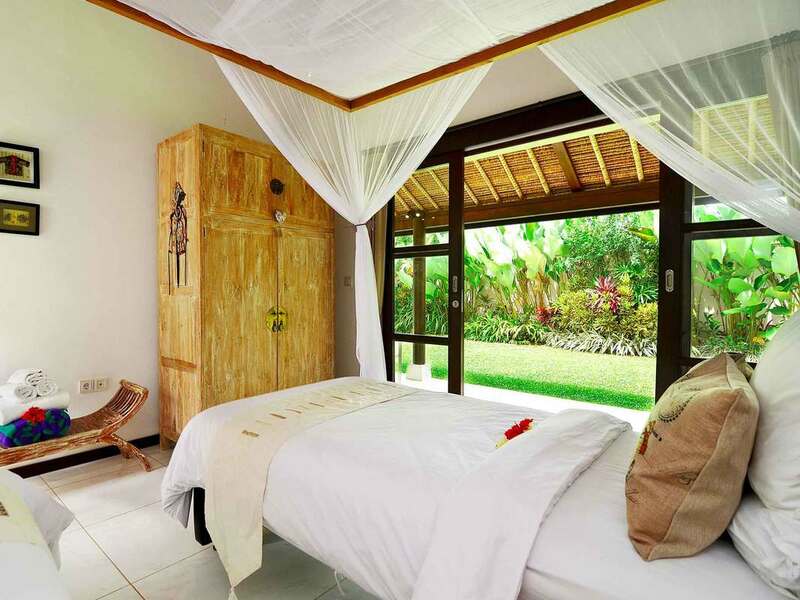 In the corner of the lush garden is a thatched-roof balé, another good spot to retreat to when in need of some privacy or peace and quiet. 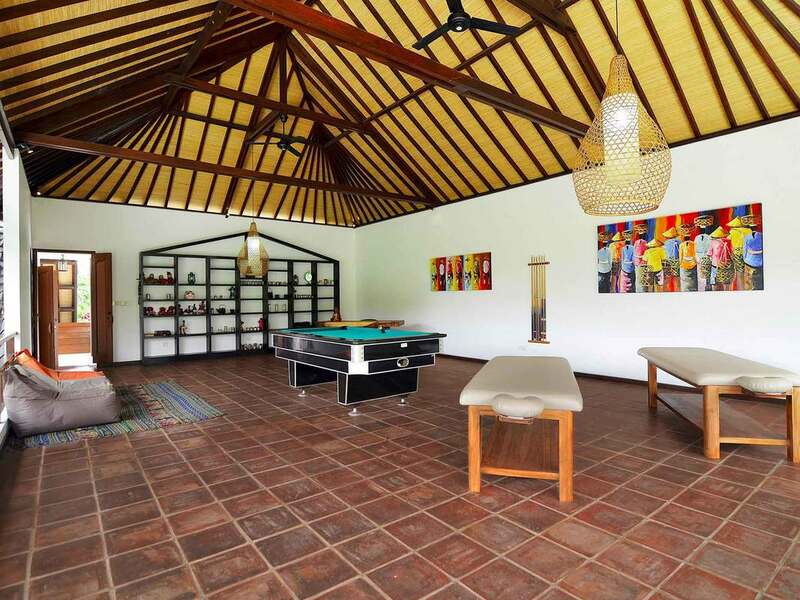 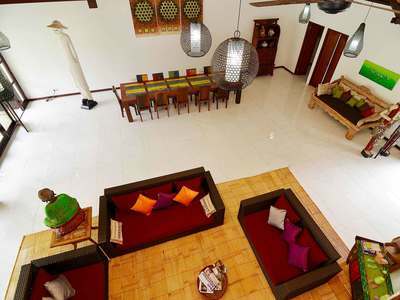 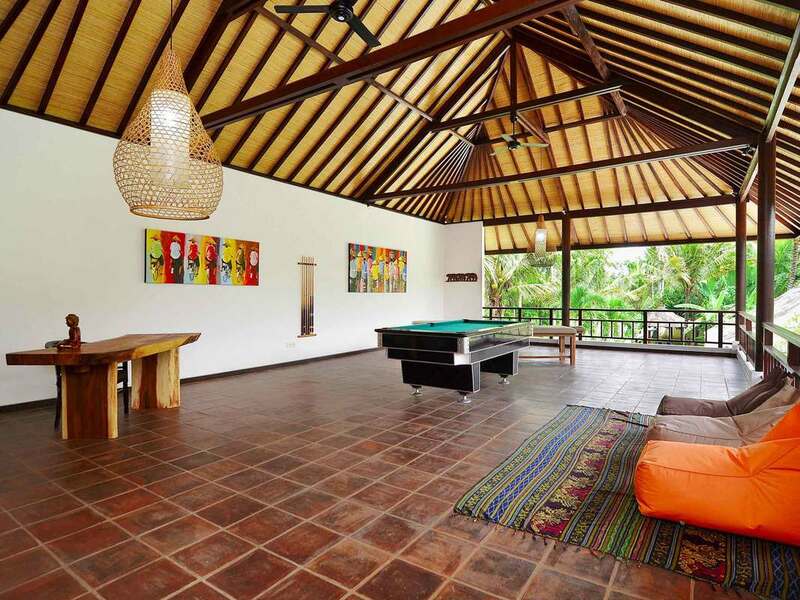 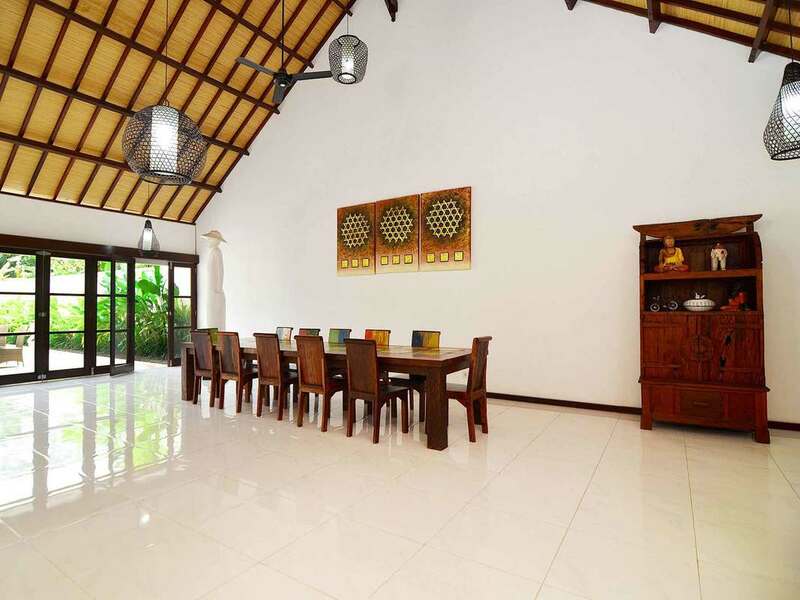 Sitting on 1400 square meters of tropical land, this villa is in no shortage of indoor or outdoor hang-out spaces! 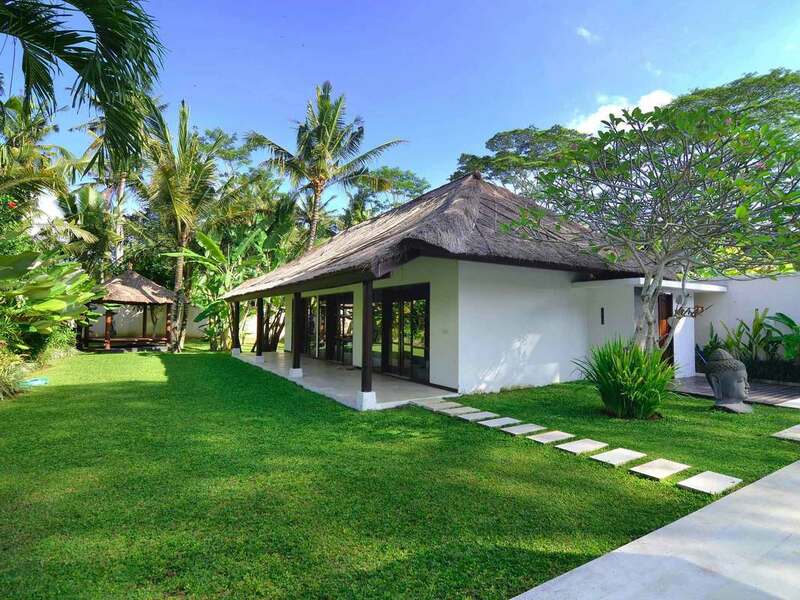 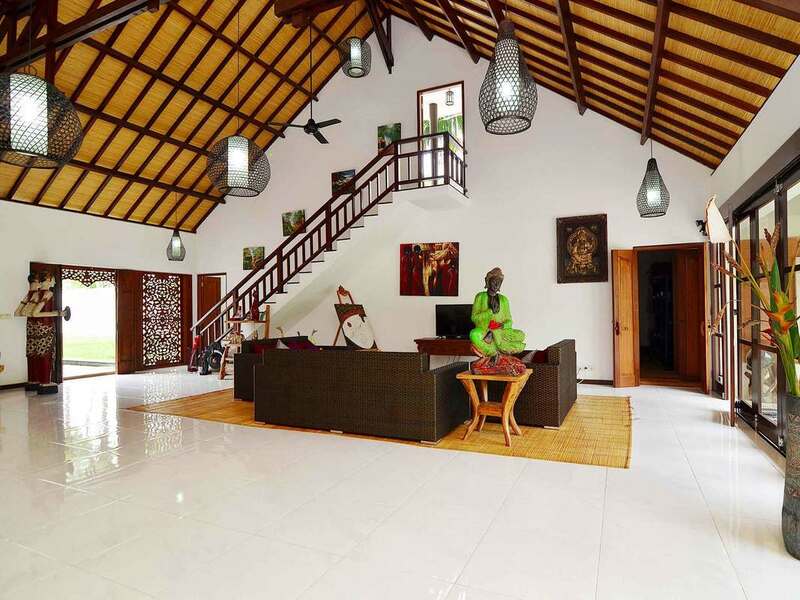 A thatched-roof gate opens up to natural stone pathway fringed by tropical greenery, leading straight towards the spacious combined living and dining pavilion of this 4-bedroom villa. 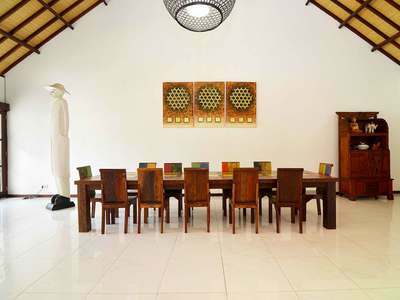 You are welcomed in a light-filled living space that beckons groups to join together for communal meals and lounge time. Situated under the high vaulted ceiling are three comfy rattan sofas which form an L-shape around the floor seating space, styled tastefully with sitting pillows and a natural bamboo mat. The master bedroom is accessible from both the living room and the garden. 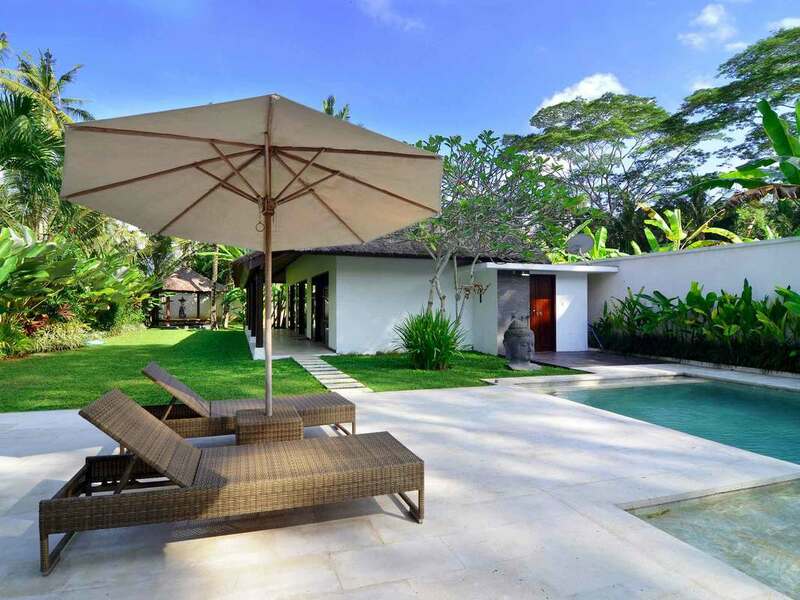 Great for guests who like to soak up the morning sun, sipping their coffee outside on the garden's stone sun deck before going for an early morning swim. 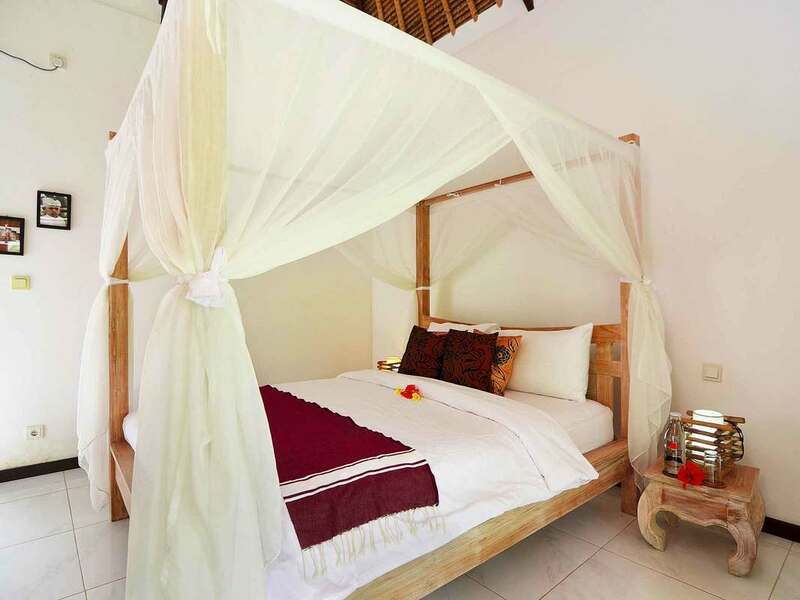 This spacious bedroom is elegantly furnished with a four-poster bed, a sofa to curl up with a good book and a satellite TV mounted to the wall. There is a walk-in dressing room and an open-air garden-like en-suite bathroom fitted with a bathtub and an outdoor rain-shower. 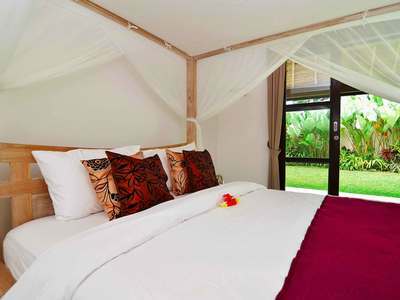 The three compact and cozy guest bedrooms are located in a standalone structure across the pool from the main living pavilion. 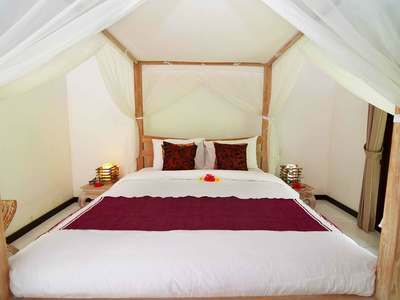 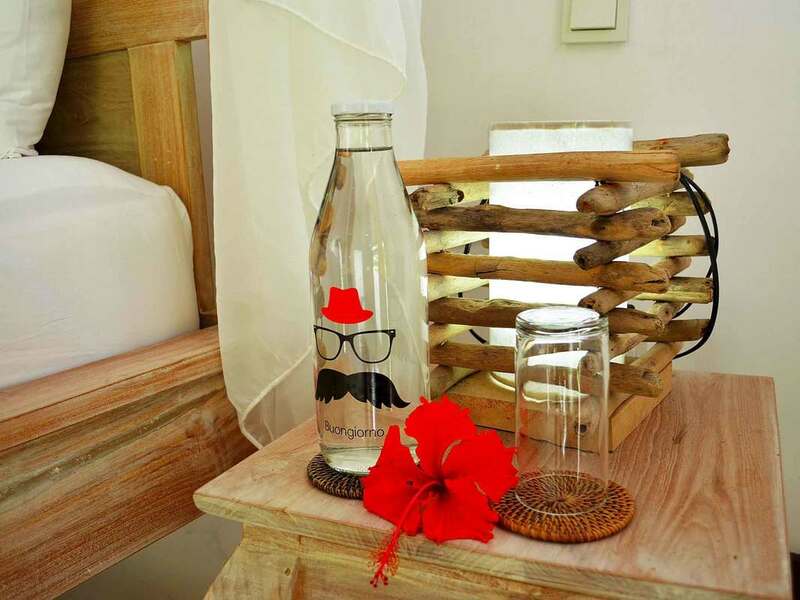 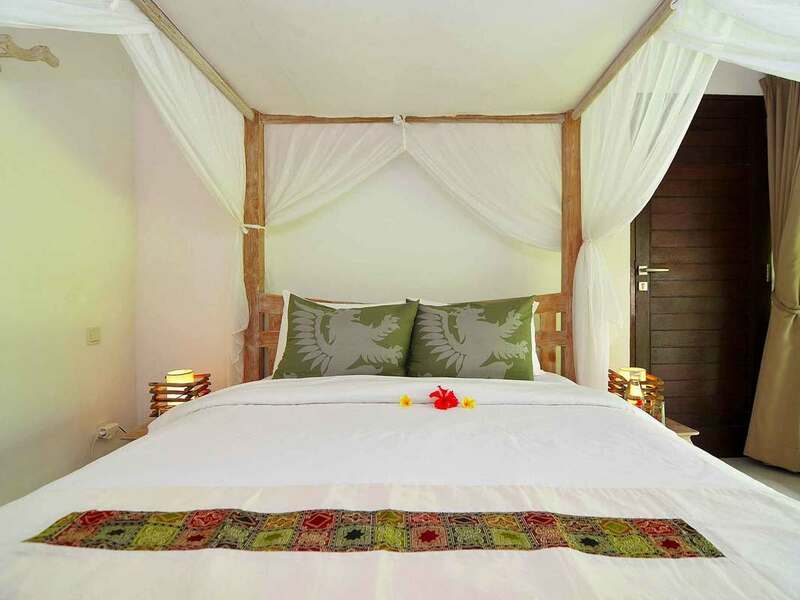 All rooms are fitted with air-conditioning, queen-size four-poster beds adorned in white linens and mosquito netting, wardrobe closets and private en-suite bathrooms. 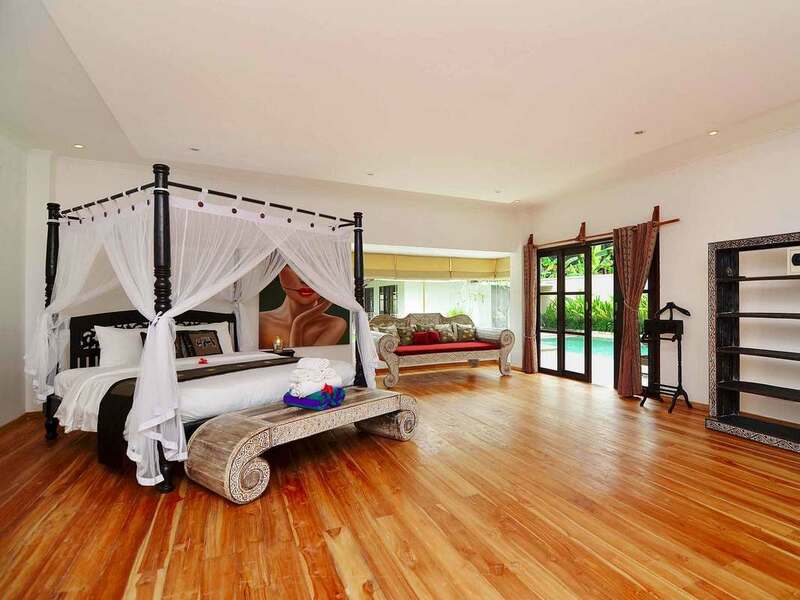 The middle room can be converted into a pair of twin beds if needed, plus it has a connecting door to the last suite which is especially ideal for families with kids. 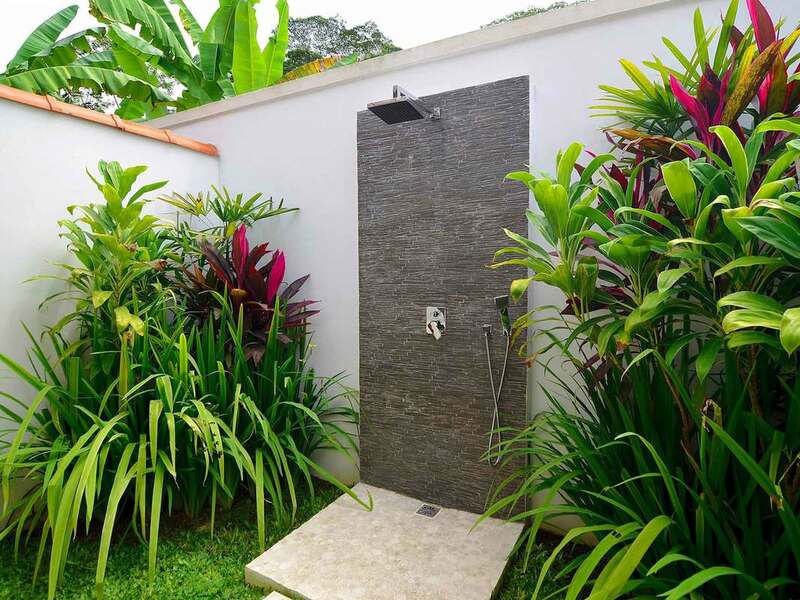 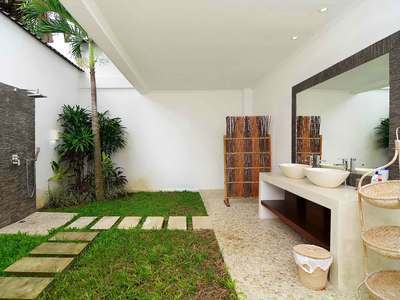 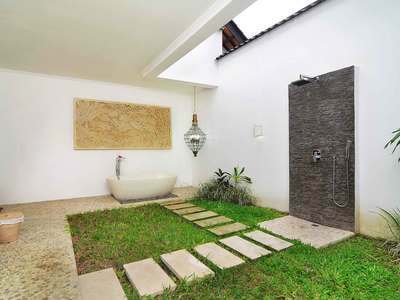 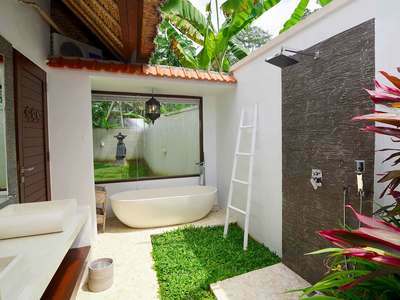 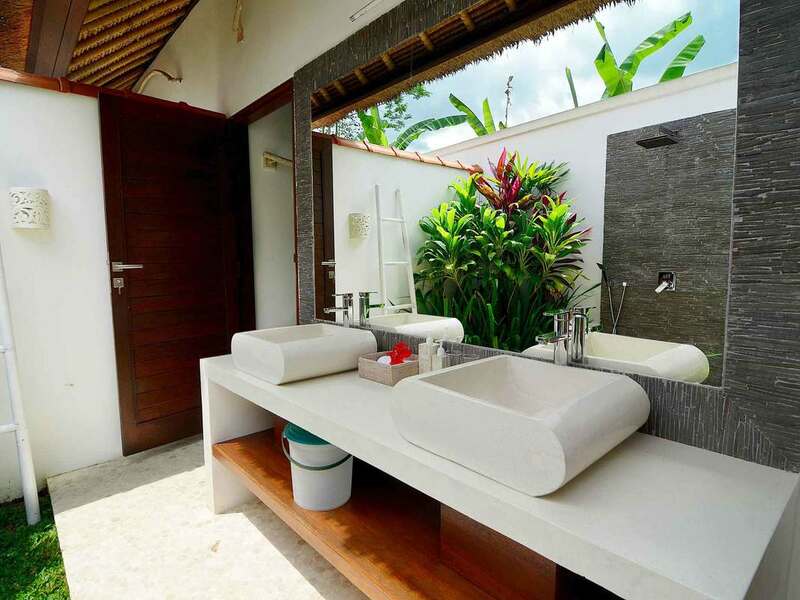 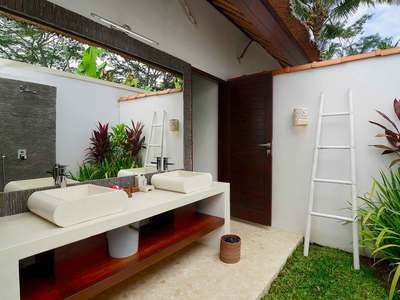 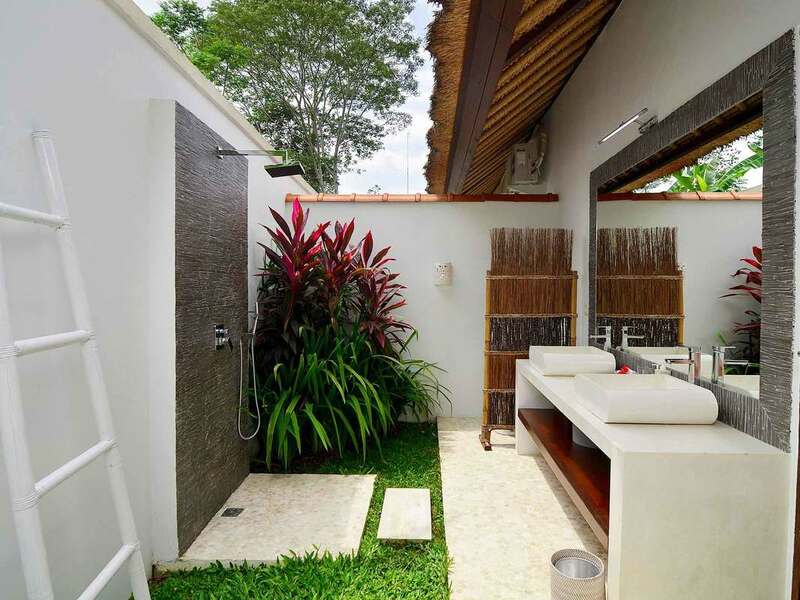 Every en-suite bathroom is nestled in an open-air garden setting. 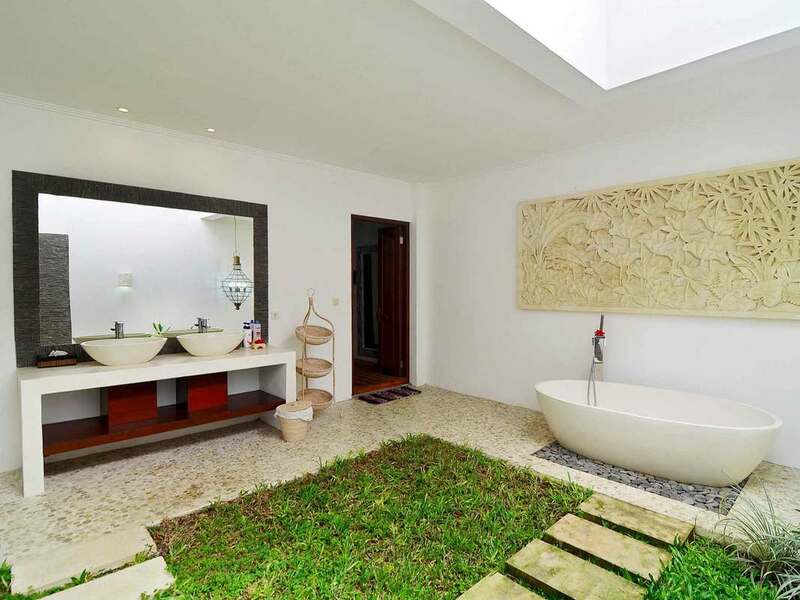 One of them also features a bathtub to relax in at the end of the day. The staff of villa Candi Kecil Empat stands by at your service 24/7. 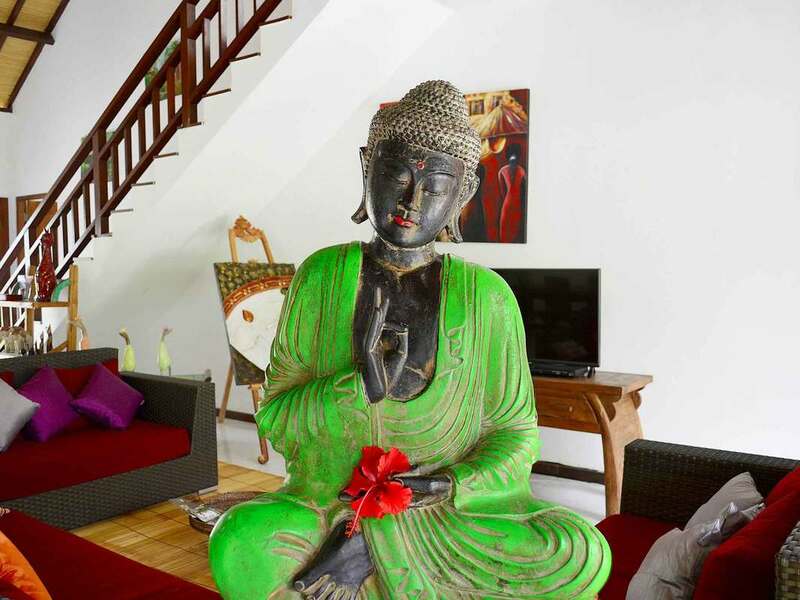 There is a friendly villa manager always reachable on call, attentive personal guest assistance, housekeeping and night security. 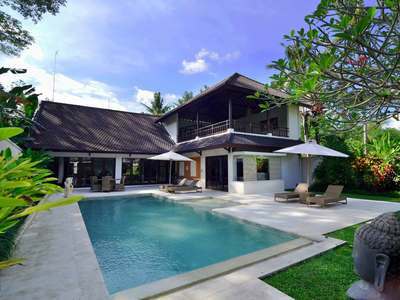 Chill out here, read a book, watch a movie on the TV, whatever! Behind the sofa lounge stands a colourful, 12-seater dining table, constructed with the reclaimed wood from Balinese fishing boats. 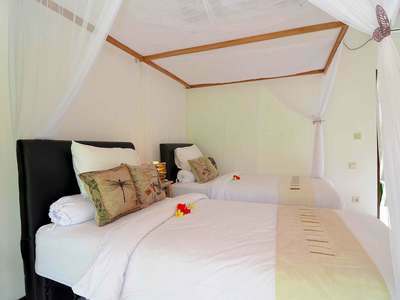 Upstairs, two massage beds are available.